The Panthers entered the 2017 draft in an interesting situation. To the surprise of many (including myself), Florida chose to expose their leading goal scorer from last season in Jonathan Marchessault, and proceeded to trade another of their top 6 forwards in Reilly Smith to Vegas. Combine that with the departure of Jaromir Jagr, and you are left pondering as to who the Panthers expect to score goals for them next season. After a wildly disappointing season, it is clear that Florida didn’t see these players as part of their core moving forward and so they chose to restructure their offence. With five picks in this year’s draft (1st round, 2nd round, 3rd round, 5th round and 6th round) including the tenth overall pick, Florida had some exciting options to help fill the void left by the departures of 1/2 of their top six. 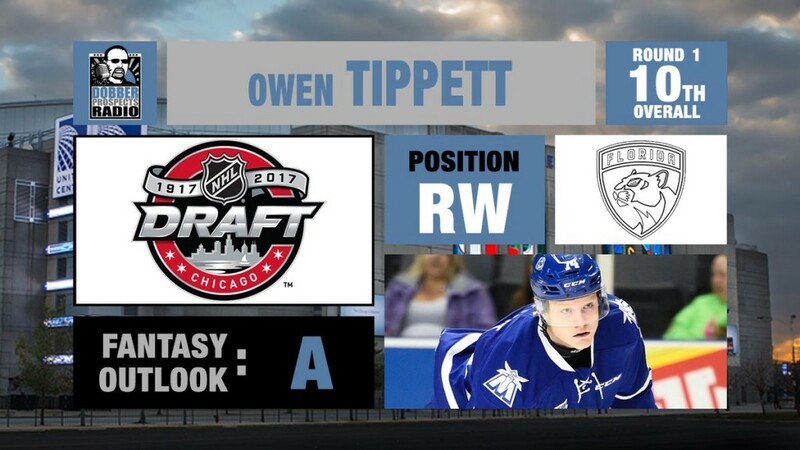 In my opinion, Florida hit an absolute home run with Mississauga Steelheads’ winger Owen Tippett at 10th overall. Not only did they select one of the best pure goal scorers available in the draft, they filled one of the holes on the wing that were created this off-season. Let’s not forget, with the departures of Jagr, Marchessault and Smith, the Panthers have to replace a combined 61 out of their total 205 goals from last season. 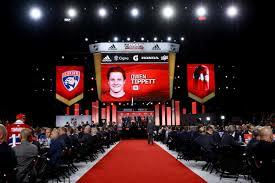 Although Owen Tippett may not be the sole answer to their problems, he does possess the most NHL ready shot in the draft and will have plenty of opportunity to crack the top six in Florida. As is the case with many rookies entering the league, Tippett has a great deal of work to do in improving his play in his own end. However with the offensive talent he has to work with in Florida, I wouldn’t be surprised to see him develop into a well-rounded 20-30 goal scorer. After selecting a big sniping winger with their first round selection, Florida went slightly in the opposite direction with their second rounder, selecting undersized center Aleksi Heponiemi from the WHL’s Swift Current Broncos. I have always respected Florida’s tendency to not shy away from players based on size, as is seen with many of the prospects in their organization. Although not the biggest player on the ice, Heponiemi makes up for it with outstanding speed and hockey IQ. He has the ability to frustrate and embarrass defenders with his amazing ability to see the ice and consistent willingness to outwork his opponent. With a frame of 5 foot 9 and approximately 150 pounds, Heponiemi will definitely need to add some size and muscle before making the leap at the professional level, however he definitely has the tools to compete and become a versatile player within the Panthers organization. With their 3rd round selection, the Panthers selected their first defenceman of the draft in Max Gildon, out of the U.S National Development Team. Gildon joins the great class of Brian Leetch, Tyler Myers and Seth Jones as Texas born defenceman drafted in the NHL. Gildon is lucky enough to possess the lethal combination of size and intelligence, as he always seems to be in the right place defensively when he is on the ice. He is seen as more of a work in progress as he will need to add some muscle to his 6 foot 3 frame and is still developing his offensive game, however Gildon has the potential to become a very solid two-way, bottom four defenceman. The Panthers kept with the same theme as their 3rd round selection in the 5th round, drafting defenceman Tyler Inamoto out of the U.S National Development Team. Inamoto is a solid two-way defenceman who doesn’t shy away from using his physicality with forwards. He’s a good skater and possesses a big frame, however he will need to add an offensive element to his game to really take it to the next level. He has committed to the University of Wisconsin next year, which will allow him to get the minutes and coaching necessary for his development. With their final selection in the draft, the Panthers selected 21 year old forward Sebastian Repo out of the Finnish Elite League. Repo registered 32 points in 46 games last year with the championship winning Tappara Tampere. The Panthers recently signed Repo to an entry-level contract, so the expectation is that he will report to Springfield to begin his development within the organization. Repo has an amazing work ethic and although his offensive ability is apparent, doesn’t shy away from playing with a physical edge. Repo will have several fellow countrymen within the organization and will look to learn from idol, Aleksander Barkov. With the right development and refinement to his game, Repo has the potential to become a solid bottom six forward with the ability to play up and down in the lineup. Florida’s development camp ran from June 27th to June 30th and featured all of this year’s draft selections as well as top prospects such as Henrik Borgstrom, Jayce Hawryluk, Samuel Montembeault and Henrik Haapala, who was signed as a free agent earlier this summer. The Panthers Finnish prospects put on a display at the development camp, with prospects Sebastian Repo, Henrik Haapala and Henrik Borgstrom turning heads with their offensive ability. Another noticeable prospect was Maxim Mamim, who recently signed an entry-level contract and will join Springfied next season after spending the last 3 seasons in the KHL. Goalie Samuel Montembeault continues to look like Florida’s future starting goalie and stated that he hopes to join Springfield this season and make the leap from the QMJHL.